Not sure if it is my daughter but I think she has a sweet tooth. She loves this! Anything with fruit is a go for us, I am looking to add more vegetables but having this is great when in a hurry. Wasn’t sure about the quinoa in this but it was surprisingly tasty. Bub loved this and took to it straight away. You couldn’t notice the taste of quinoa but it was great knowing it was more filling than just fruit. 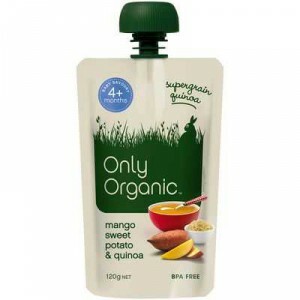 I tried all the squeezy packet ranges of baby food – savoury and sweet, fruit and meat, and normally bubs would love this range (and me too, as I know that he is eating healthily), however he wouldn’t eat this one (despite loving mango). How would you rate Only Organic 4 Months Mango Sweet Potato & Quinoa?